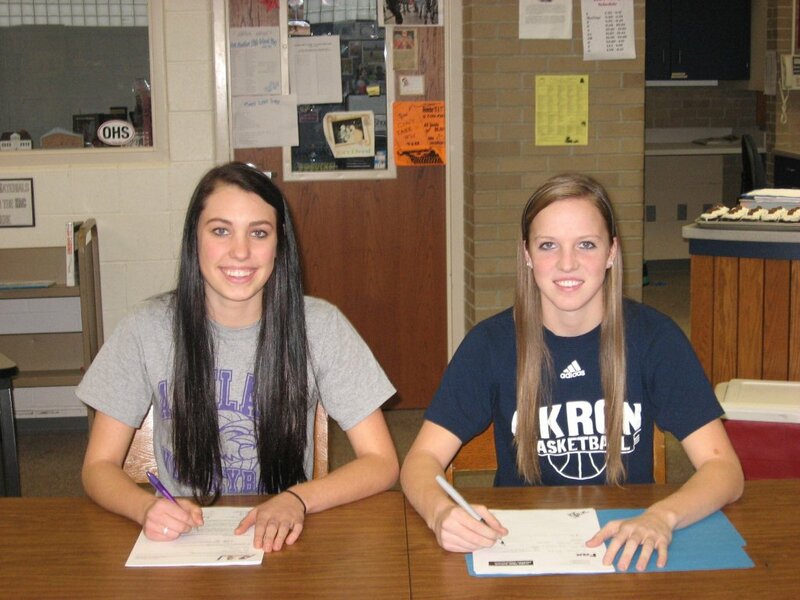 Orrville seniors Rylee Scott (L) and Hannah Plybon sign their college letters of intent on Wednesday. Congrats to Orrville seniors Hannah Plybon and Rylee Scott on inking their college letters of intent on Wednesday. Plybon will play basketball on a full ride at The University of Akron and Scott will receive a full tuition and books scholarship to Ashland University to play volleyball. Plybon has led the girls basketball program in scoring each of the last 3 seasons and (by my count) is exactly 100 points away from being the all-time leading scorer in school history. She is also seeking a rare 4th All-Ohio honor and another 1st team All-Ohio honor this season would make 3 straight..another super rare feat. Scott, a 2-time All-OCC honoree, was recently named 2nd Team All-Ohio Division 3 and was a key part of the Red Riders Final Four run. Congrats to Rylee and Hannah. Continuing the tradition of Red Riders excelling at the college level. I won't add them to my "College Riders" list until their days at Orrville are finished, but wanted to ask everyone to review the list and please let me know if I'm missing anyone else. By my count we have over 30 alums playing sports at the collegiate level. Congrats to Orrville senior Zane Vierheller for being named to the OCC first team and also Honorable Mention All-Northeast Inland District. Junior Trevor Summers was named 2nd team All-OCC and Honorable Mention All-Northeast Inland District while fellow junior Joel Zook was named Honorable Mention in both the OCC and the Northeast Inland District. Harrison Brown and Chase Infield were also selected as Honorable Mention OCC. Congrats to Hannah Plybon and Rylee Scott for being named All-OCC first team, Maggie Davault (2nd team) and Raegan Renner and Triniti Hall (Hon. Mention). Also, pictures from the Final 4 game against Bishop Ready are available for purchase here. Congrats to juniors Chad Harrison and Layne Scheufler for being named to the Northeast Ohio Golf Coaches Association Division Two 2nd team. For the 2nd time this season, Mason Monheim has been named the Big10 Freshman of the Week for his 15 tackle performance against Purdue last weekend. He leads his team in tackles and is 14th in the entire conference in tackles and the only freshman in the top 50 in the conference in tackles. His 74 tackles put him 7th among all freshmen in the country and tied for 4th among freshmen linebackers. congradulations to Kyle Johnston, he was made an offer to play baseball at Glenville State University. A Div.2 school in West Virginia.